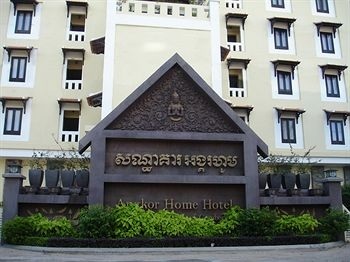 ANGKOR HOME HOTEL is in the city of Siem Reap, Cambodia, the Jewel of Indochina and the home of the Angkor temples. The Angkor Home Hotel is located in the heart of Siem Reap town and only ten kilometers away from the gateway of the magnificent of Angkor Wat. Angkor Home Hotel is an ideal base for discovering the splendid wonders of the Angkor heritage and its temples. 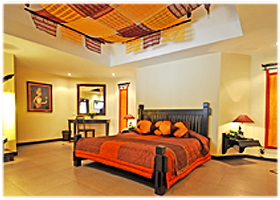 The hotel is just eight minutes from the Siem Reap international airport and five minutes to Siem Reap town. 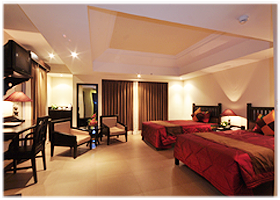 Superior rooms are elegant and simply designed. The rooms are 32 square meters in size and offer twin beds with private balconies. Rooms are facing the city and the swimming pool. Deluxe rooms are spacious with king size beds and are located on the fifth floor. The rooms are 36 square meters in size and facing the city and the swimming pool. 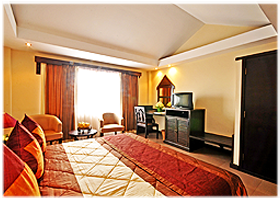 Decoration and concept of rooms are ideal for an enjoyable stay. 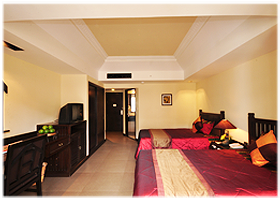 Junior suites are beautifully decorated with modern facilities and amenities. 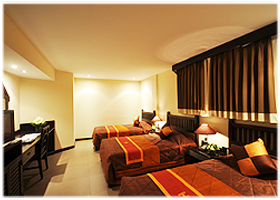 The rooms are 51square meters in size, with twin beds which offer a comfortable and enjoyable stay just like home. The Home Suite is spacious and beautifully decorated with modern mixed facilities and offering one bed room with king size bed attached to a large living room space. Size is 64 sqm with balcony and facing the city.